Stewart recently prepared the Granville County Comprehensive Plan that addresses and the community’s priorities and anticipated growth in ways that preserve the community character, foster economic development, and recognize the County’s natural assets. The population of Granville County is estimated at 59,000 and is approximately 536 square miles with five municipalities: Butner, Creedmoor, Oxford, Stem and Stovall. The County is located in the Kerr Tar and Triangle region of North Carolina and is adjacent to two metropolitan centers, Raleigh and Durham. The work program included a significant level of community involvement consisting of popup meetings, workshops, social media, community preference surveys and the use of both steering committee and stakeholder groups. 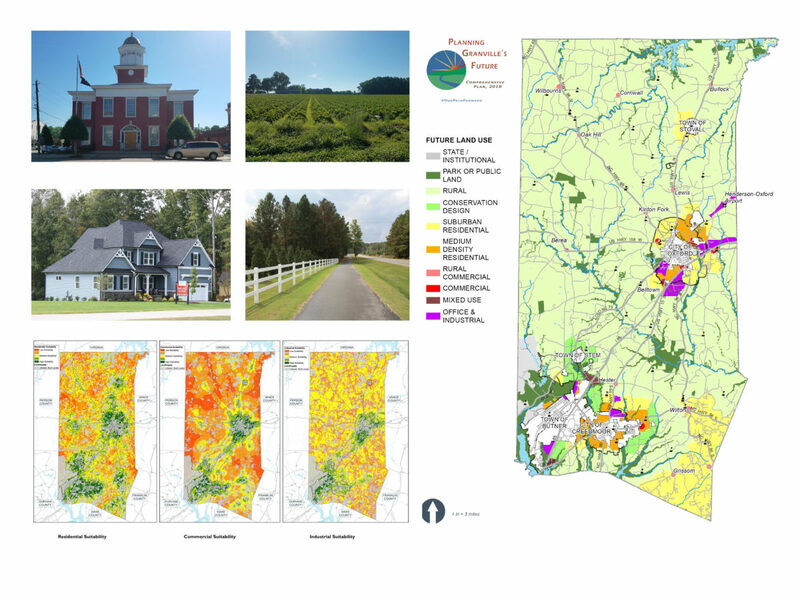 As part of the project, Stewart analyzed land use suitability, water and sewer capacity and utilized CommunityViz to help the County understand implications of different land use scenarios and capacity for growth. This modeling provided an insight into the impacts that land use policies can have on neighborhoods, the economy, infrastructure and the environment. The plan identified commerical, mixed use and employment opportunities, clarified density and design expectations in residential growth areas and included recommendations to maintain agricultural lands.